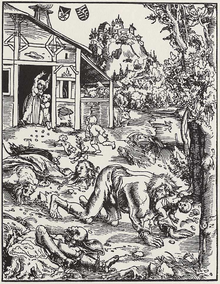 A warwouf (frae Auld Inglis: wer, "man"), man-wouf, Wouf Man, or lycanthrope (Greek: λυκάνθρωπος, lykánthropos: λύκος, lykos, "wouf", an ἄνθρωπος, anthrōpos, "human") is a mythological or fowklairic human wi the abeelity tae shapeshift intae a wouf or a therianthropic hybrid wouf-lik craitur, either purposely or efter bein placed unner a curse or affliction (e.g. via a bite or scart frae anither warwouf). This page wis last eeditit on 5 Mey 2017, at 03:55.